Today's guest is Kathreen, the powerhouse behind WhipUp which was my introduction to the Australian crafting scene. Kathreen has such passion and creativity and it shows through her work so I was really chuffed when she agreed to the interview. Hi Kathreen, great to have you here. Could we start off with you telling us a little about yourself and your family? Sure thing. I am a mother and maker. I have a Cultural heritage science (preserving historic buildings and textiles and such), which I completed in my early 20s, and another in visual arts (mainly photography and media studies) which I completed in my early 30s. In between these I spent a year studying Mandarin Chinese in Beijing China and got married and had 2 children. My two children - Otilija is 11 years old and Orlando is 9 years old, are my proudest achievements and biggest source of inspiration. And my husband Rob is my creative rock -- my go-to person and best friend. We live in the suburbs in a medium sized city in Australia and have some ducks and chooks and veggies in the backyard. We live a simple life, but full of creativity and energy. We send our kids to an alternative school that has a strong focus on outdoor education, creativity and student directed learning and as a result their schooling and/or our parenting style and/or their own selves are extremely competent and capable and creative kids. Last year you seemed to be in Wonder Woman mode, releasing a new book every other week (well that is how it felt!) launching Action Pack, which we love, keeping Whip-up going and popping up all over the place. How on earth do you manage it? It only seemed that way! It was weird and crazy but also a complete co-incidence. As a result of the different publishing houses publishing schedules my Quilt book with Chronicle which had been in the pipeline for two years just happened to co-incide with the series of Kids' Crafternoon books that I worked on for Hardie Grant books only a year before. So while it seemed liked I was working myself to death -- in fact it only looked that way! I did launch Action Pack last year -- As I was not working on a book project and being either a glutton for punishment or a work-a-holic I decided to take Action on our kids magazine idea.I manage my schedule in a bit of a haphazard way. Because I work from home I am available for the kids after school, I am able to get a little washing and housework and crafts done here and these in between whatever project I have simmering at the time. I do have a bit of a daily work schedule which involves checking emails early in the morning, then getting the kids off to school and doing a spot of housework or running of errands etc before buckling down to work until the kids get home from school. Of course when there is a deadline - self imposed or otherwise - I work evenings and weekends, but then I make for this at other times -- it all evens out in the wash.Working for yourself, building a brand or a business, freelancing or selling products (or all of these things) takes time, energy, effort and perseverance. My family understands that sometimes I am working all hours, but the flip side is that I am home and available to them after school and luckily I have an amazing husband who can pick up the slack when required. Let's talk about Action Pack, how was the idea born and why did you choose to go down the PDF path rather than traditional printing? Action Pack is a kids magazine. It contains no ads which we see as incredibly important, however this means that someone has to pay for it - many free online magazines are full of ads which is fine for adults but not so great for impressionable kids who don't need all that commercial junk in their lives just yet. We decided it would be a PDF magazine for a couple of very practical reasons: 1. printing, distribution, postage is all very expensive and takes a lot of time and we are a small business made up of me (and my husband and kids). And 2. a PDF is easy to deliver online, easy to print or read on the computer and on a portable device. So therefore the PDF format cuts down the costs of production and therefore the cost of purchase. Maybe one day if we get picked up by a big publisher you might see our magazine on shelves, but until that day comes it is simply not a viable option for us to print, distribute and post it as a hard copy magazine. One of the things I love about the magazine is that it is themed, I find it much easier to plan Ebi-kun's activities if I have a theme to work with. How do you pick the theme for the next issue? As a family we have a huge amount of fun brain storming themes. These depend upon our current interests and what is happening in the world and the seasons. And from kids making electricity with lemons to quilting. You also released last year Little Bits Quilting Bee, your second quilting book, can you share your design process? Do you choose a colour pallet first or does the design come first, how does it all work? When making quilts I spend a lot of time on the research and design stage. I make colour charts based on images and fabrics and I constantly sketch designs and audition fabrics - I love this process and it is my favourite favourite part of the whole process. So many of the quilts in my latest book are special because I agonised over them and loved them all - they are all my babies. But perhaps the 5 flavours quilt (top right or pg 125 in the book) is my most special quilt, I just love how the design came together perfectly, the colours I had in my head all worked and the dense pebble quilting that I did on this quilt really pulled it all together. Of course, we also have to talk about the Kids Crafternoon books, a series aimed at 8-12 year olds on felting, beading, papercraft and sewing. How did this project come about? I was approached by the publisher Hardie Grant to put this series of craft books together. They heard about me via my blog and the Australian crafting scene, after I met with the publisher we discussed the books and then I was given quite tight parameters about the content of the book. It was a lot of fun and I working within a strict set of guidelines is actually very freeing. How much say did you have in the actual styling of the books? I didn't have any say in the styling of the books and in fact most authors don't! There is a point where the publisher takes the information you give them and then hands it on to their in house designers who work with the layout team and the photographer and the editor to design and style the book as per their vision. I did however work with my husband on the illustrations and of course I chose all the contributors - so in that respect it was a collaborative project. I feel like I could ask you questions all day but I will finish off with, who or where do you draw your inspiration from? I get my inspiration from everywhere. My kids, over heard conversations, magazine images, the web, vintage postcards, patterns and linens, books, ... just about everywhere really. I keep notebooks -- not the most pretty ones - they tend to be practical books filled with words or haphazardly drawn sketches, glued in fabric swatches etc. and then when it is time to design a project or look for ideas I go back through my sketchbooks and something will often leap out at me - often out of context - and ideas begin to emerge around it like particles swirling around sun - colliding and merging into a solid form. Before you go, a question from Ebi-kun... What is your favourite dish from Australia? Australian cuisine is very multi-cultural - in our house we love to eat both sushi and curry (not together though). Pavlova is the kids favourite Australian dessert. You can follow Kathreen on Twitter and Facebook and of course on WhipUp. Loved this interview, very exciting and interesting read. This is so cool!!! Wonderful interview... I just love and adore WhipUp!!! 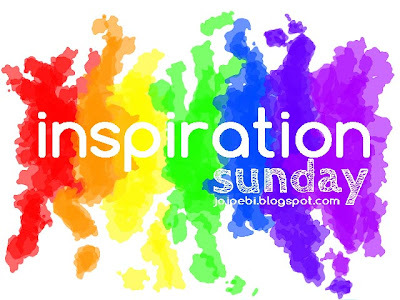 I love the idea of an inspiration Sunday - can't wait to read more!!! Nice interview :) Thank you for a good read about one of my favorite crafty women.